Pro Shot l4.7 Magnum Rotary Laser with FREE Shipping to the US and Canada. Pro Shot l4.7 Magnum Rotary Laser with Detector from Tri County Transit. Perfect for the commercial or general builder who performs a wide range of elevation and layout tasks that go beyond extremely accurate leveling. Pro Shot l4.7 Magnum Rotary Laser is a unique combination of performance and utility. The Pro Shot� L4.7 Magnum construction laser combines class leading accuracy with a highly visible rotating beam and plumb spot. 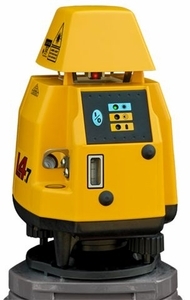 Perfect for the commercial general builder who performs a wide range of elevation and layout tasks that go beyond extremely accurate leveling, including 4ft or 1m marks, 90� layout, vertical plane alignment and highly accurate vertical point transfer. Specifications 2000' dia., 1000' rad. (610m/305m) �7 arc sec. (�.040" per 100') (�1.0mm per 30m) Precision compensator � �10 arc min. Yes, using optional bracket. 360� � 0 to 500rpm variable. Highly visible 635nm CDRH class IIIa IEC Class 3R To international standard IP56 -4� F to +122� F (-20� C to +50� C) Range with R8 laser receiver . Accuracy .040" in 100ft. Self leveling type � Range 2000ft dia. Vertical capability With optioal bracket, Rotation coverage 360 deg.� speed 0to 500 rpm variable. Machine control compatible ... Warranty 36 month guardian. Power source � 4 C-Cells 60 hrs. Rechargeable batts. optional 40 hrs. L4.7 Mag. laser system including R8receiver and carrying case. We carry Pro Shot rotary lasers, which make you a one person leveling crew. They give you one person grade checking and elevation control. We have lasers for grading, elevation control, land leveling, drop ceilings and a variety of other applications. Our Pro Shot construction rotary lasers combine affordability, accuracy and a lot of other features.